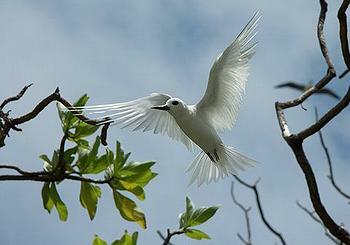 HONOLULU, Hawaii, January 31, 2013 (ENS) – Birds, crabs and rare trees are expected to recover on Palmyra Atoll, a collection of islets located about 1,000 miles south of Hawaii, now that roughly 30,000 rats have been eradicated by the U.S. Fish and Wildlife Service and conservation groups. Palmyra was this month given a rat-free bill of health more than a year after about the invasive predatory rats were killed to protect 10 nesting seabird species, migratory shorebirds and the rare coconut crab. One of the largest remaining forests of native Pisonia grandis, a rare flowering tree in the bougainvillea family, is also expected to benefit from its newly rat-free environment. 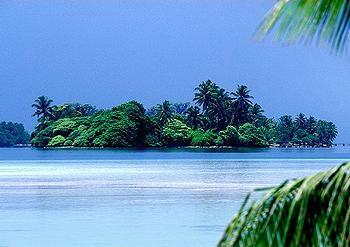 Palmyra Atoll is cooperatively managed by the U.S. Fish and Wildlife Service and The Nature Conservancy as a National Wildlife Refuge and a scientific research station. The area includes 25 islets covering 580 acres of land, and thousands of acres of healthy coral reefs. In 2009, the refuge and waters surrounding it were also included in the Pacific Remote Islands Marine National Monument. Non-native black rats were likely introduced to the atoll during World War II, and the population grew to as many 30,000 rats. The invasive rodents eat eggs and chicks of ground and tree-nesting birds, particularly sooty and white terns. Rats also eat land crabs and the seeds and seedlings of native tree species. To reverse this trend, in June 2011, the U.S. Fish and Wildlife Service, The Nature Conservancy, and Island Conservation removed the rats from Palmyra Atoll, using a rodenticide that had been successful in similar projects on other islands. The Palmyra rat-eradication project is the first step in the Palmyra Atoll Restoration Project, a longer-term effort to restore the atoll’s ecological balance. “This wonderful atoll is again able to thrive the way nature intended—without rats. Palmyra has been infested with rats for so long, there will be benefits to wildlife we didn’t even fully anticipate – such as the explosion of the fiddler crab population that we’re seeing,” said Susan White, monument superintendent and refuge project leader, Pacific Reefs National Wildlife Refuge and Monuments Complex, U.S. Fish and Wildlife Service. Using the same proven methods that were used years before to detect the extent of the rat problem on Palmyra, scientists conducted surveys over a month-long period this summer and confirmed that the entire atoll is currently rat-free. In the tropical climate at Palmyra, rats reproduce every three to four months, so conducting surveys one year after the removal effort is sufficient time to detect rats remaining on the atoll. During the summer, the project partners established a network of 286 rat detection stations that covered the entire atoll. Each station was checked four times during the course of the month. Team members also spent hundreds of hours scouring the atoll for natural indicators of rat presence, but found none. They did find signs of the recovery of native species over the past year. “Millions of seabirds, trees, crabs and other native species can now thrive in their home without the threat of being eaten by rats,” said Suzanne Case, executive director of The Nature Conservancy’s Hawaii program. 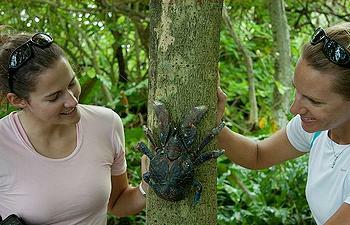 “Staff and visitors to the atoll have seen a large increase in the numbers of crabs, insects, seedlings and seabirds. Our collective efforts to bring balance back to Palmyra are working,” said Case. The University of California Santa Cruz Coastal Conservation Action Lab is monitoring Palmyra’s terrestrial ecosystem by comparing measures of seabird, shorebird, and plant populations taken before and after rat removal. In the summer of 2012 they found a 130 percent increase in seedlings of Palmyra’s 10 locally rare native tree species, and the first record of Pisonia seedlings. No seedlings were observed in 2007 before the rats were removed. The UC researchers found a 367 percent increase in arthropods such as insects, spiders, and crabs. The found no change in the numbers of bristle-thighed curlews, a native bird species. Special care was taken to ensure this imperiled species was not harmed by the rat removal.